petition: Pledge to vote YES on Arizona's Prop 127 for Local Jobs, Clean Air! Pledge to vote YES on Arizona's Prop 127 for Local Jobs, Clean Air! Proposition 127 will increase Arizona's renewable energy goal to 50 percent by 2030. 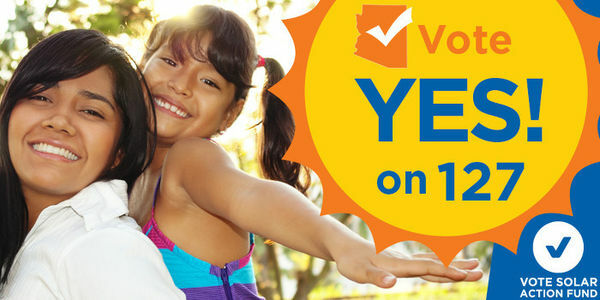 Pledge to vote YES and put more of our plentiful sunshine and other renewable resources to work for Arizona, creating more jobs, reducing harmful pollution, and building a healthier and brighter future for our children! YES on Proposition 127 for healthier communities: Everyone has the right to clean air and clean water, but burning fossil fuels emits sulfur, mercury and other toxins that disproportionately impact the health of seniors, children and communities of color. Vote YES to healthy clean energy and help cut down on asthma, lung disease, and cancer. YES on Proposition 127 for lower energy bills: Solar costs have decreased by 80% over the last decade, meaning that solar power is actually the cheapest source of electricity for Arizona today. Studies show that diversifying Arizona&apos;s electricity mix with more low-cost solar and other competitive clean options save $4 billion in energy costs, putting money back in the pockets of hardworking Arizona families and businesses. YES on Proposition 127 for local jobs: Solar already employs more than 8,380 Arizonans at more than 400 companies across the state, many of which are local small businesses. The Bureau of Labor Statistics projects that solar installers and wind technicians will be the two fastest growing jobs in America over the next decade! Prop 127 will mean that more of those new energy jobs are in Arizona. Paid for by Clean Energy for Healthy Arizona Committee. Not authorized by any candidate.